Dearborn sits as part of the Detroit metropolitan area and was the home of Henry Ford. Change things up with these side-trips from Dearborn: Cedar Point (in Sandusky), Ann Arbor (Parker Mill Park, Decode Ann Arbor, & more) and Heritage Park (in Canton). There's much more to do: see the interesting displays at The Henry Ford, take in panoramic vistas at Perry's Victory & International Peace Memorial, admire the masterpieces at Toledo Museum of Art, and explore and take pictures at Comerica Park. To find more things to do, reviews, photos, and tourist information, go to the Dearborn trip planner . Brisbane, Australia to Dearborn is an approximately 24-hour flight. You'll gain 15 hours traveling from Brisbane to Dearborn due to the time zone difference. September in Dearborn sees daily highs of 28°C and lows of 17°C at night. Wrap up your sightseeing on the 15th (Tue) to allow time to travel to Brisbane. You'll find plenty of places to visit near Brisbane: Surfers Paradise (SkyPoint Observation Deck, Infinity Attraction, & more), Warner Bros. Movie World (in Oxenford) and Sea World Theme Park (in Main Beach). Pack the 25th (Fri) with family-friendly diversions at Dreamworld. Spend the 28th (Mon) exploring nature at Conondale National Park. The adventure continues: let the kids burn off some steam at South Bank Parklands, tour the pleasant surroundings at Currumbin Wildlife Sanctuary, kick back and relax at Mooloolaba Beach, and admire the natural beauty at Roma Street Parkland. 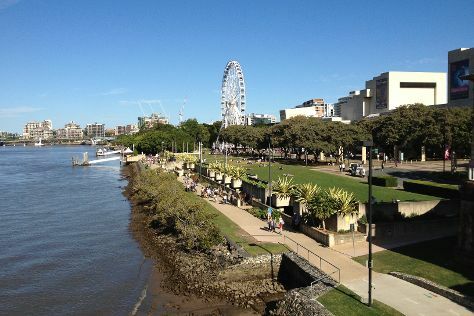 To find reviews, more things to do, traveler tips, and more tourist information, refer to the Brisbane day trip planner. Explore your travel options from Dearborn to Brisbane with the Route module. The time zone changes from Eastern Standard Time (EST) to Australian Eastern Standard Time (Queensland) (AEST), which is usually a 15 hour difference. In September in Brisbane, expect temperatures between 28°C during the day and 15°C at night. Finish your sightseeing early on the 1st (Thu) to allow enough time to travel back home.